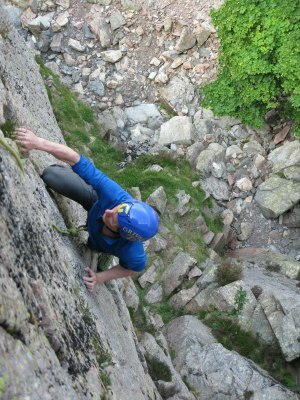 We run the majority of our rock climbing courses in the Lake District where we call home. The area is steeped in climbing tradition and has some of the highest quality rock climbing on offer in the UK set amongst the dramatic Lakeland landscape and culture. There are high mountain crags with long multi-pitch climbs, valley crags with quick access to maximise your time on the rock, and various bad weather options in the quarries of the area and lying a short distance outside the mountains of the central Lake District. We also offer private courses in the North Yorkshire, and across Scotland and the Hebrides. Regular venues for us being Ben Nevis and Glencoe, Dunkeld and the Isle of Skye, usually for guiding on specific routes or the pursuit of ‘Classic’ and ‘Hard’ rock routes. We can offer bespoke days out that can focus on instruction to help you improve your own climbing and become independent when out, this can include teaching you to lead climb placing traditional protection and making belays whilst managing the rope-work. Or perhaps you would prefer a more guided approach with less intensive instruction, this allows a lot of ground to be covered or could be more appropriate if a specific route is the aim of the day. Follow the link for more detail – Guided day or Instruction – what’s best for you? Note – We only run technical climbing courses at a 1:2 instructor client ratio max. We can supply additional instructors for larger groups wanting technical climbing or you can look at Group Programmes for group climbing sessions for larger groups wanting a ‘bottom roped’ climbing session.